For the life of me, I don't know exactly what this type of wall treatment is called! 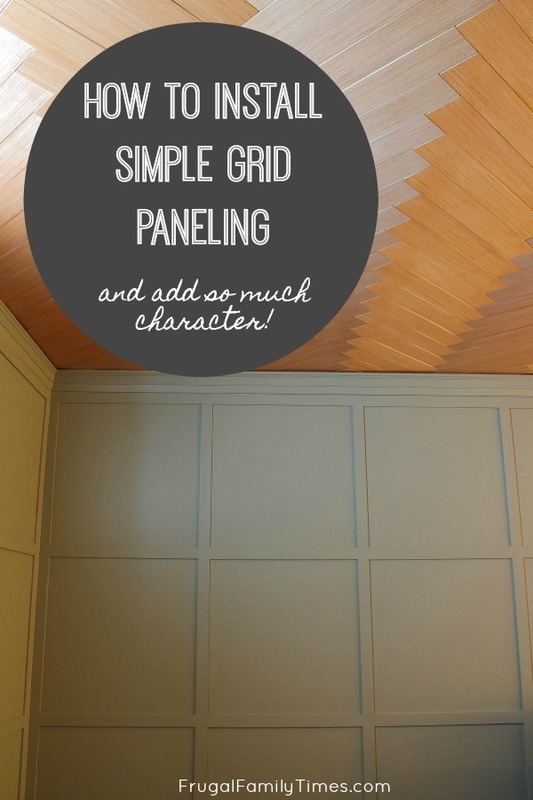 Is it "grid paneling? Is it "box moulding"? Is it "square paneling"? I don't rightly know! 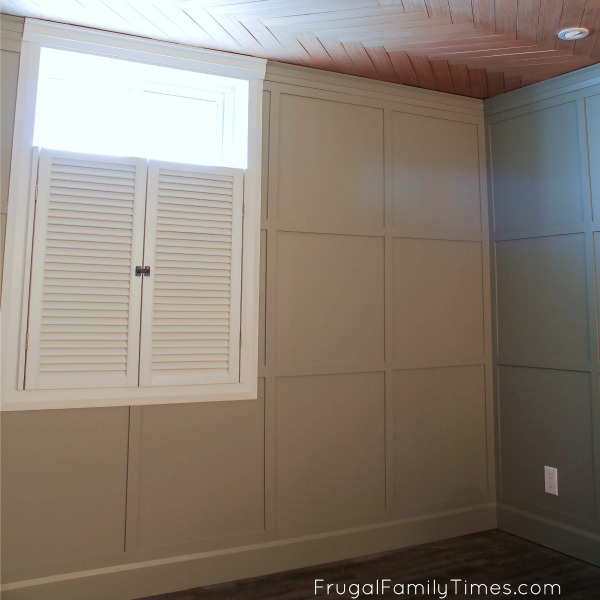 What I do know is adding this trim is an easy and affordable way to add character to an otherwise bland wall. Can a room be more bland than this one? It's like (slow motion) magic! Nail up a few strips of wood and in front of your eyes, a rich texture emerges. After we painted the wall and wood strips, we thought we were transported to a much fancier den a la Downton Abbey. 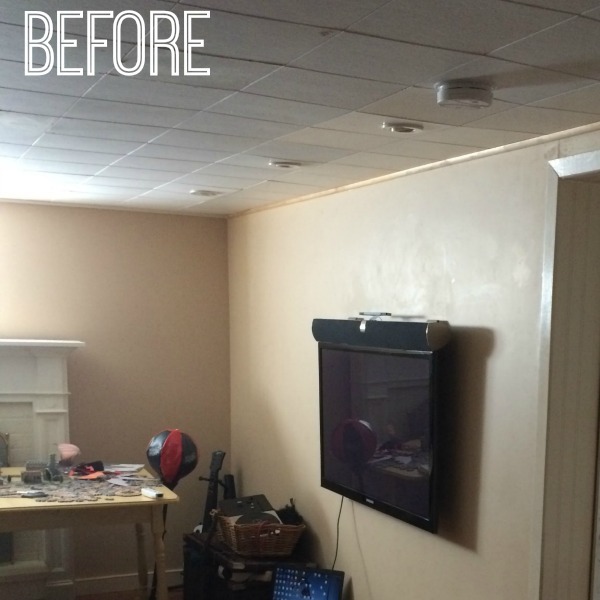 Certainly not the same old bland box our basement media room was before! It's seriously incredible! It is simple in profile and easy to cut and work with. It also has the added benefit of being the same depth as the narrowest part of both our baseboards and crown mould, so everything looks consistent. We used finger-jointed pine because that was the only material we could find this size in. MDF would be cheaper - but sadly not available to us. The math can be tough - make it easier by doing the border first. We drew a line across the top of the wall where the crown mould would land. We already had the baseboards in place. We then used the trim to frame a border into a large rectangle. You can now try various widths for the vertical battens (which, in turn, dictates the sizes of your squares). Consider drawing them on the wall to get a good visual before you start nailing. With the distances between the battens decided on and marked out, measure, cut and attach the vertical pieces of trim. We used construction adhesive in addition to our finish nailer to make sure the stayed where we put them. When all the vertical battens are in place, it is time to add the horizontal sections to make the box moulding pattern. The width of the panels will obviously dictate the height of your boxes but know that you don't have to make them perfectly square - but it's essential that they run perfectly parallel. Unless your room is a perfect square - with windows and doors perfectly centred in walls - you are going to need to make some tough decisions. The finished photo above illustrates some of these. The main wall - on the right - has no openings and it was relatively easy to set the size of the squares. The wall on the left is smaller and has an offset window. What we had to do was fudge the measurements of the squares - the squares on this wall are slightly smaller. Can you tell? I can't. You will likely have openings that you need to work around - in an ideal world the opening would be in the centre of the squares - that's not often possible. We plan to have drapes on either side of the window that will distract from the off-centre of the grid around it. 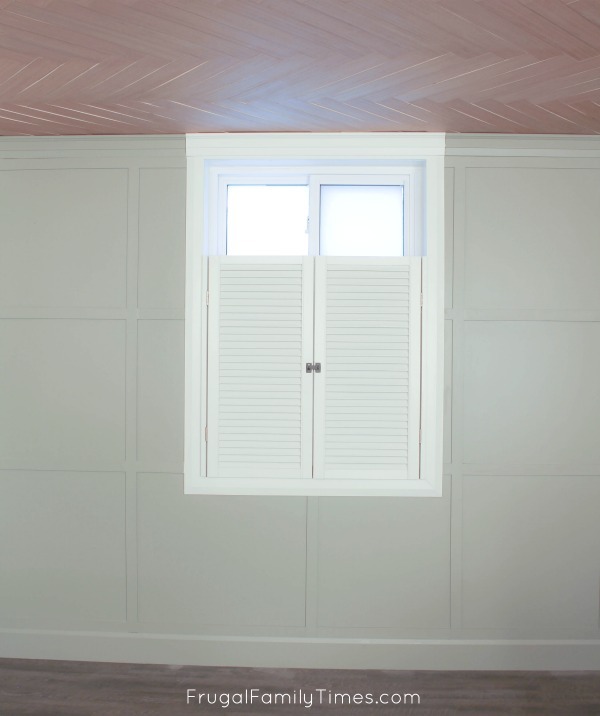 We chose to put a vertical batten in the centre of the window - because that will be noticed. In person, it looks just right. You can see things are starting to take shape. We initially hadn't planned on doing trim above the baseboard, but when we got to this point, we decided it was the way to go. Next time we will have one complete piece of trim across the whole bottom. When you have two walls with the box panelling meeting in the corner, we treated each wall as its own space and trimmed both edges. This made for a heftier, bulked up look that we liked in the room corners. Almost done - use spackling to fill any nail holes or other uneven sections. Then give everything a sanding. Be careful not to round the edges of the trim - you just want to remove any roughness or imperfections. Pay careful attention to any area where the trim is meeting or intersecting - the thickness often is not uniform - and you'll need to build up your spackling to cover this. Paint, fill and sand any imperfections that jump out at you and then give the whole thing a final coat. The sage green paint we chose is the same as the panelled accent wall in our basement guest room/library: Milk Thistle by Behr. You can pretty well do this whole project in a weekend if your room isn't too large. Great return on investment for both your time and money! i like your ideas. i have used a few of them and always wait to see what is next. the board and batton is great! thanks for sharing and showing how to make projects more affordable!